Yao, S., Gao, C., Zhu, H., Zhang, Y., Wang, S., and Qin, C. (2016). "Effects of additives on absorbable organic halide reduction in elemental chlorine-free bleaching of bagasse kraft pulp," BioRes. 11(1), 996-1006. In order to further reduce absorbable organic halide (AOX) formation in the bleaching effluent, NH2SO3H and DMSO were added during the elemental chlorine-free (ECF) bleaching (D0EpD1) of bagasse kraft pulp. In the D0 stage, AOX formation decreased by 10% with 0.1% NH2SO3H, and a reduction of 11.2% with 1.0% DMSO, respectively. 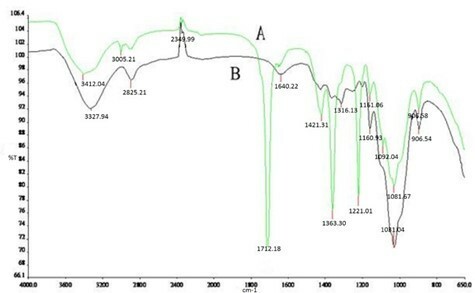 Ultraviolet (UV) spectra, Fourier transform infrared spectroscopy (FTIR), and gas chromatography-mass spectroscopy (GC-MS) were adopted in characterizing changes of lignin degradation and the main functional groups of bleached pulp. The UV spectrum showed that the quantity of polyphenols decreased after adding the additives. The FTIR spectrum showed that both the content of phenolic-type lignin and the degradation degree of lilac-type lignin decreased after adding NH2SO3H. If was found that DMSO was beneficial in retaining C-O-C and C=O structures in cellulose and hemicellulose, while NH2SO3H decreased the content of β-glycosidic bonds and C-O-C structures in cellulose and hemicellulose. The composition of lignin degradation products in the bleaching effluent was analyzed by GC-MS. The contents of chlorobenzene and chlorophenol decreased notably when additives were added. Compared with DMSO, NH2SO3H exhibited poor inhibition on the formation of some phenols. Contact information: a: College of Light Industry and Food Engineering, Guangxi University, Nanning, 530004, PR China; b: The Guangxi Key Laboratory of Environmental Engineering, Protection, and Assessment, Guilin 541004, PR China; *Corresponding author: qin_chengrong@163.com. 1These authors contributed equally to this work. Organic pollutants discharged from pulp and paper facilities mainly come from the bleaching system (Sridhar et al. 2011). A large quantity of harmful substances are produced by hypochlorite bleaching and chlorination reactions in the traditional chlorine-alkali extraction-hypochlorite (CEH) bleaching process, which causes an enormous threat to the environment (Chen et al. 2003; Balcıoğlu et al. 2007). The best way to solve this problem is to adopt an effective bleaching method with low pollution and that is elemental chlorine free (ECF) (Calvo et al. 2007; Sharma et al. 2014) or total chlorine free (TCF) (Shatalov and Pereira 2008; Marques et al. 2010; Requejo et al. 2012). Pulp and paper enterprises may benefit from the unification of the environmental, economic, and social benefits when ECF bleaching technology is employed, with chlorine dioxide as the primary bleaching agent (Marques et al. 2010). The production of absorbable organic halogens is greatly reduced when an ECF process is employed in pulp bleaching (Calvo et al. 2007; Liu et al. 2015). Since the papermaking industry produces a large amount of wastewater annually, the total AOX released into the environment is increasing. Organic pollutants (POPs) (Morselli et al. 2014; Byer et al. 2015; Curren et al. 2015), such as AOX, cause an enormous threat to the environment. In order to further reduce AOX formation during the chlorine dioxide bleaching process, some measures have been developed through research (Baycan et al. 2007; Deshmukh et al. 2009). Research indicates that AOX in bleached kraft pulp mill effluent can be reduced by about 30% by using an alkaline sulphide chemical treatment (Francis et al. 1997). Pulp mill effluent was treated with hydrogen peroxide, Fenton’s reagent, UV light, and other reagents, and the effects of some of the operating parameters, such as the initial pH, oxidant, and catalyst concentrations on AOX removals were investigated (Catalkaya and Kargi 2007). Chaparro and Pires (2015) investigated the post-treatment of anaerobic effluent by ozone and ozone/UV of a kraft cellulose pulp mill. The combination of ozone/UV showed better results in colour and total phenols compared with only ozone. The chronic toxicity and the genotoxicity that had already been removed in the anaerobic process were slightly increased. Xylanase and laccase were evaluated in the ECF of eucalyptus kraft pulp, and it was found that the enzyme treatment at pilot scale lowered AOX levels by 34% in the effluents (Sharma et al. 2014). AOX comes from the substitution reaction between HClO and aromatic ring of lignin at low pH values. In order to decrease the AOX formation during chlorine dioxide bleaching process, some measures were put forward. For example, a low pulp concentration can be used. The washing between chlorine dioxide and alkali extraction stage can be omitted. Alkali extraction can be enhanced by oxidation. Changing pH in the D0 stage (the initial pH 2~4, the final pH 8~9) can have an effect. Adding additives, such as dimethyl sulfoxide (DMSO) (Joncourt et al. 2000), hydrogen peroxide (Baycan et al. 2007), or amino sulfonic acid (Yoon and Wang 2002), etc., can be considered. In this work NH2SO3H and DMSO were added during ECF bleaching (D0EpD1) of bagasse kraft pulp in order to further reduce AOX formation in the bleaching effluent. NH2SO3H and DMSO were added to study the effect of NH2SO3H on AOX formation after D0 and D1 stage, respectively. Fourier transform infrared (FTIR) analysis was carried out with or without NH2SO3H and DMSO. This was mainly to characterize the changes in lignin degradation. Then gas chromatography – mass spectroscopy (GC-MS) analysis of bleaching effluent was done, with or without additive, in order to observe the changes of AOX major component. The technology and the principle of AOX reduction were explored. Unbleached bagasse pulp was provided by a pulp mill in Guangxi, China. The pulp’s Kappa number was 11.54, the brightness was 40.51% ISO, and the viscosity was 1349 mL/g. Sodium sulphide was purchased from Aladdin Industries in Shanghai, China. Activated carbon and ceramic cotton were purchased from the Analytik-Jena Instrument Company (Jena, Germany). Sodium chlorite, hydrochloric acid, sodium hydroxide, sulfuric acid, potassium iodide, and sodium thiosulfate were purchased either from KeLong Chemical Co., LTD. (Chengdu, China) or from Chuandong Chemical Co., LTD. (Chongqing, China). All of the chemicals were of analytical grade. During the experimental process of adding additives, the operating conditions of ECF bleaching were unchanged. In the D0 stage, the pulp concentration was 10%, the ClO2 dosage was 1.6%, the temperature was 60 °C, and the time was 60 min. In the Ep stage, the NaOH dosage was 2.5%, the H2O2 dosage was 1.0%, the temperature was 65 °C, and the time was 90 min. In the D1 stage, the ClO2 dosage was 0.4%, the temperature was 70 °C, and the time was 75 min. The content of AOX in the bleaching effluent was measured on a Multi X2500 AOX analyser (Germany) (Nie et al. 2014). The basic method and process was as follows: the organic chloride of the bleaching effluent was adsorbed when the bleaching effluent was passed through the activated carbon column. The adsorbed, inorganic chloride was washed using sodium nitrate. The activated carbon column was burned in a combustion furnace and the content of the AOX was calculated. The sheet made of pulp after the pulp had been resuspended in water using a disintegrator, and then the brightness of sheet was measured by YQ-Z-48 brightness meter (China). 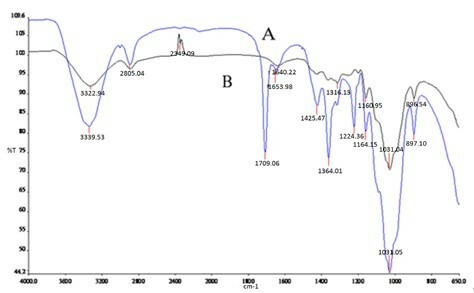 The FTIR spectra of the bagasse fibers were measured on a Nexus 470 spectrometer (Hewlett-Packard, USA) using 16 scans and frequency range of 500 to 4000 cm-1. Signal averages were obtained at a resolution of 4cm-1 (Yao et al. 2015). Samples were mixed with KBr in a ratio of 1:10 mg (Bagasse: KBr) and pressed under a vacuum to form pellets. The chemical composition of the bleaching effluent was quantified by GC-MS (Agilent 6890-5973, USA) (Kukkola et al. 2006; Singh et al. 2008).The basic method and process were as follows: One litre of bleaching effluent was collected, and its pH was adjusted to 5.5. The effluent was continually extracted three times using an aether separator funnel, and the organic phase was taken out. Aether solution was dehydrated by anhydrous NaSO4 post-extraction. Then, the solution was concentrated to 5 mL using a rotary evaporator. The concentrate was stored in a bottle with a nitrogen headspace, and 1μL of the sample was measured. The temperature of the injection port was 250 °C, and the temperature of the interface was 230 °C. The column pressure was maintained at 50 kPa, and helium gas was used as a carrier gas at a rate of 15 mL/min. The oven temperature program was set at 80 °C for 2 min, then increased at a rate of 5 °C /min to 220 °C, followed by 10 °C /min to 280 °C, then held for 5 min. The oven pressure was increased from 50 kPa to 100 kPa at a rate of 1 kPa/min, resulting in a 42-min ramp time. Mass spectra were recorded at 2 scan/s under electron impact at 70 eV; the mass range was 29 to 500 m/z; the voltage of the detector was 1.2 kV (Qin et al. 2015). The effect of NH2SO3H on AOX formation was studied by changing the dosage of NH2SO3H, which was added in D0 stage (Fig. 1). Five bleaching effluent samples were collected after the D0 stage. The NH2SO3H dosage of five bleaching effluent samples was 0, 0.025%, 0.05%, 0.075%, and 0.1%, respectively. In Fig. 1, AOX formation decreased as the NH2SO3H dosage was increased. AOX formation decreased by 10% with the addition of 0.1% NH2SO3H. AOX was mainly derived from chlorolignin during the delignification. The reaction between HClO and lignin generated chlorolignin. In fact, chlorite does not react with lignin during the chlorine dioxide bleaching; it was generated and transformed by some reaction. There was a small amount of chlorolignin in the pulp after the D0 stage; AOX formation using NaOH was added to dissolve chlorolignin. A small amount of AOX remained in the D1 stage. 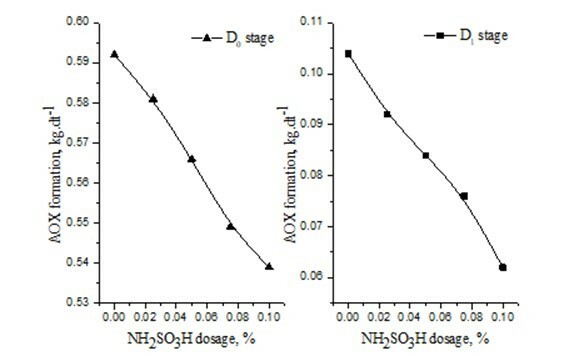 The effect of NH2SO3H on AOX formation was studied by changing the dosage of NH2SO3H, which was added in both the D1 and D0 stages (Fig. 1). Five bleaching effluent samples were collected after the D1 stage. The NH2SO3H dosage of five bleaching effluent samples was 0, 0.025%, 0.05%, 0.075% and 0.1%, respectively. In Fig. 1, AOX formation decreased by 11.8% with the addition of 0.05% NH2SO3H. The effect on AOX formation by adding NH2SO3H resulted in minimal chlorolignin formation and chlorine dioxide in the D1 stage. The experimental results show that AOX formation was decreased by adding NH2SO3H. Figure 2 shows the effect of NH2SO3H dosage on bleached pulp brightness after D0 stage. The brightness of bleached pulp decreased as the NH2SO3H dosage was increased, but the decline was very small. The brightness of bleached pulp was 81.8%ISO without NH2SO3H addition, and it was 79.3%ISO with 0.1% NH2SO3H addition. Based on the combined results for AOX formation and the brightness test, it can be concluded that adding NH2SO3H is can lead to success of the bleaching treatment. Research shows that the reaction between DMSO and HClO is faster than the reaction between HClO and H2O2 or oxalic acid (Eshkiki et al. 2007). Thus, HClO formation was suppressed by DMSO during the bleaching process, leading to a reduction in AOX formation (Fig. 3). Five bleaching effluent samples were collected after the D0 and D1 stages. The DMSO dosage of five bleaching Effluent samples was 0, 0.25%, 0.5%, 0.75%, and 1.0%, respectively. Figure 3 shows the effect of DMSO dosage on AOX formation. In Fig.3, AOX formation reduced as the DMSO dosage increased. AOX formation was found to be 0.592 kg.dt-1 without the addition of DMSO, but it was 0.502 kg.dt-1 with 1.0% DMSO addition. It decreased by 11.2% with the addition of 1.0% DMSO after the D0 stage. DMSO presents weak alkalinity and stronger nucleophilic activity than S2-. 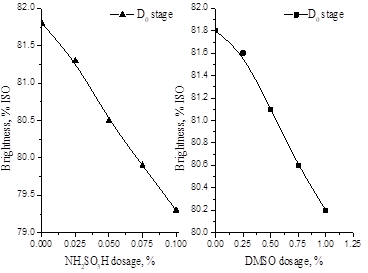 Figure 3 also demonstrates the effect of DMSO on AOX formation after D1 stage. AOX formation was 0.104 kg.dt-1 without DMSO addition, but it was 0.09 kg.dt-1 with 0.5% DMSO added after the D1 stage. AOX formation was reduced by 19.2% with the addition of 0.5% DMSO. This had an adverse effect on AOX and resulted in a low concentration of chlorolignin in the D1 stage. The experimental results show that AOX formation was reduced by adding DMSO. 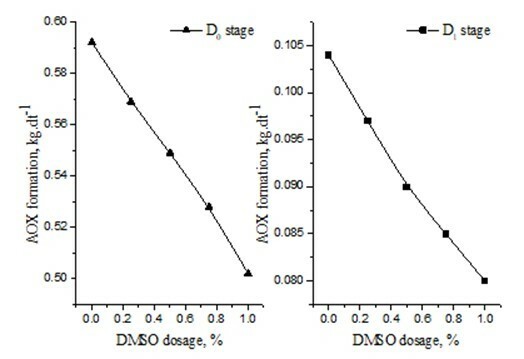 Figure 2 also shows the effect of DMSO dosage on bleached pulp brightness after the D0 stage. The brightness of bleached pulp reduced as the DMSO dosage increased, but the decline was very small, similar to the effect of adding NH2SO3H. The brightness of the bleached pulp was 81.8%ISO without additives, and it was 80.2%ISO with 1.0% DMSO added. In terms of the AOX formation and brightness results, one can say that a successful bleaching operation was achieved when adding DMSO. In Fig. 3, the broad band ranging between 3100 cm-1 and 3450 cm-1 was attributed to the C-H stretching vibration. The absorption peak shifted and the relative absorption intensity was reduced by adding NH2SO3H, demonstrating that the amount of phenolic lignin was reduced. The band near 1316 cm-1 was principally attributed to the aromatic ring frame vibrations of syringyl and condensation products involving guaiacyl groups. But in Fig. 3B, the band was shifted to 1363.30 cm-1 by adding NH2SO3H; this means that the degradation of aromatic rings was promoted. The band ranging from 1163 cm-1 and 1160 cm-1 was attributed to C-O-C stretching vibration formed by cellulose and hemicellulose. The relative absorption intensity was weakened by adding NH2SO3H, and the degradation of cellulose and hemicellulose increased. The band ranging between 893 cm-1 and 897 cm-1 was attributed to β-glycosidic bonds. The relative absorption intensity was weakened by adding NH2SO3H, and the degradation of cellulose increased. New absorption peaks appeared at 1713.18 cm-1, 1421.21 cm-1, 1363.3 cm-1, 1223.01 cm-1, and 1092.08 cm-1 by adding NH2SO3H. The absorption band peak near 1713.18 cm-1 was attributed to C=O stretching vibration. The band near 1421.21 cm-1 was attributed to benzene vibration and C-H plane vibration. The band near 1363.3 cm-1 was attributed to O-H formed by aromatic residues. The band near 1223.01 cm-1 was attributed to methyl ether bond formation by syringyl. The band near 1092.08 cm-1 was attributed to secondary hydroxyl groups formed by guaiacyl. Therefore, part of the carboxyl structure and more lignin structure was retained, the degradation of residual lignin and S-lignin was suppressed, and the removal of G-lignin was inhibited. In conclusion, the content of phenolic lignin and conjugated carbonyl groups were reduced by adding NH2SO3H. However, part of the methoxyl groups formed by syringyl and secondary hydroxyl groups formed by guaiacyl were retained, and the degradation of cellulose was increased. In Fig. 4, the broad band ranging from 3100 cm-1 and 3450 cm-1 again was attributed to C-H stretching vibration. The relative absorption intensity was increased by adding DMSO, which shows that the content of phenolic lignin increased. The broad band ranging between 2850 cm-1 and 2940 cm-1 was attributed to C-H stretching vibration. As a result, the relative absorption intensity was increased and DMSO exhibited a favourable effect on retained lignin. The band near 1316 cm-1 was principally attributed to aromatic ring frame vibrations of syringyl and guaiacyl groups. The band ranging from 1163 cm-1 and 1160 cm-1 was attributed to C-O-C stretching vibration formed by cellulose and hemicelluloses. The band ranging from 1020 cm-1 and 1050 cm-1 was attributed to C=O stretching vibration formed by carbohydrates. The band ranging between 893 cm-1 and 897 cm-1 was attributed to β-glycosidic bond formation. The relative absorption strength of the above four types of absorption peaks showed increases by adding DMSO. Consequently, the degradation of cellulose and hemicellulose were reduced and a portion of S-lignin and G-lignin was retained. New absorption peaks appeared at 1709.06 cm-1, 1425.75 cm-1, 1364.01 cm-1, and 1224.36 cm-1 following the addition of DMSO. The absorption band peak near 1709.06 cm-1 was attributed to the carbonyl group formed by carbohydrates. The band near 1425.75 cm-1 was attributed to benzene vibration and C-H plane vibration. The band near 1364.01 cm-1 was attributed to O-H formed by aromatic residues. The band near 1224.36 cm-1 was attributed to a methyl ether bond formed by syringyl. This means that the degradation and removal of residual lignin was suppressed. In conclusion, DMSO exhibited a poor degradation effects on S-lignin and G-lignin; however, more cellulose and hemicelluloses were retained. 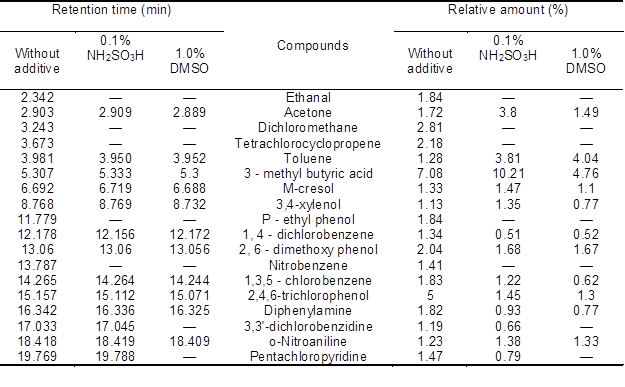 In Table 1, the content of organic compounds was reduced by adding DMSO or NH2SO3H in the bleaching effluent. A large amount of 3-methyl butyric acid, 2,4,6-trichlorophenol, dichloromethane, tetrachlorocyclopropene, 2,6-dimethoxy phenol, ethanal, p-ethyl phenol, 1,3,5-chlorobenzene, and diphenylamine were found in the extraction stage effluent that without additive. These organically bound chlorides were the chief constituent of AOX in the bleaching effluent. Noticeable amounts of acetone, pentachloropyridine, nitrobenzene, 1,4-dichloro-benzene, m-cresol, toluene, o-nitroaniline, 3,3′-dichlorobenzidine, and 3,4-xylenol was also generated. AOX formation was reduced when the additive was used. For example, the relative content of ethanal, dichloromethane, tetrachlorocyclopropene, p-ethyl phenol, and nitrobenzene essentially disappeared when using an additive. However, the removal effect for ketones, organic acids, and phenols were different. For example, the relative content of acetone was increased by 220.9% by adding NH2SO3H, but it was reduced 86.6% by adding DMSO. The relative content of 3-methyl butyric acid was increased by 144.2% by adding NH2SO3H, but it was reduced 67.2% by adding DMSO. The relative content of m-cresol was increased by 110.5% by adding NH2SO3H, but it was reduced 82.7% by adding DMSO. The relative content of 3,4-xylenol was increased by 119.5% by adding NH2SO3H, but it was reduced 68.1% by adding DMSO. The relative content of 1,4-dichlorobenzene, 2,6-dimethoxy phenol, 1,3,5-chlorobenzene, 2,4,6-trichlorophenol and diphenylamine was reduced, but there was no such effect for toluene and o-nitroaniline. The relative content of 3,3′-dichlorobenzidine and pentachloropyridine was reduced by adding NH2SO3H, but they disappeared upon the usage of DMSO. Compared with DMSO, NH2SO3H exhibited poor inhibition on the formation of some ketones, organic acids, and phenols. The formation of AOX can be reduced by use of additives in chlorine dioxide bleaching. In the D0 stage, 10.0% of AOX formation and 2.5% ISO of brightness can be decreased with a 0.1% NH2SO3 Likewise, there can be a drop of 11.2% of AOX formation and 1.6 %ISO of brightness with the addition of 1.0% DMSO. The FTIR analysis showed that the content of phenolic lignin and conjugated carbonyl groups was decreased by adding NH2SO3 However, the degradation of cellulose was increased. DMSO exhibited a poor degradation effect on S-lignin and G-lignin; however, more cellulose and hemicelluloses were retained. The GC-MS analysis showed that the content of organic compounds was reduced by adding DMSO or NH2SO3H in the bleaching effluent. Compared with DMSO, NH2SO3H exhibited a poor inhibition on the formation of some ketones, organic acids, and phenols. The authors are grateful for the financial support from the Innovation Project of Guangxi Graduate Education (YCBZ2015011) and the Guangxi Natural Fund (2013GXNSFFA019005, 2014GXNSFBA118032 & 2014GXNSFBA118060). This project was sponsored by the National Natural Science Foundation of China (B061103) and the research funds of The Guangxi Key Laboratory of Environmental Engineering, Protection, and Assessment (1301K001). The authors thank the Guangxi Key Laboratory of Environmental Pollution Control Theory and Technology for their research assistance. Joncourt M. J., Froment P., Lachenal D., and Chirat C. (2000). “Reduction of AOX formation during chlorine dioxide bleaching,” Tappi Journal 83, 144-148. Qin, C., Nie, S., Song, X., Wang, S., Fougere, J. D., and Li, K. (2015). “Influence of hexenuronic acid on AOX formation during ECF bleaching of the kraft pulp,” Industrial Crops and Products, under review. Yoon, B. H., and Wang L. J. (2002). “Chlorate reduction in ClO2 prebleaching by the addition of hypochlorous acid scavengers,” Journal of Pulp and Paper Science 28(8), 274-279. Article submitted: July 15, 2015; Peer review completed: November 7, 2015; Revised version received: November 16, 2015; Accepted: November 17, 2015; Published: December 3, 2015.